West end of Enola Yard showing the departure end of the westbound hump, this yard was rebuilt in 2003 by Norfolk Southern to reinstate hump yard operations due to traffic demands on the former PRR system. Part of the 1902 mainline improvements project the Enola Terminal served as a western anchor for President A. J. Cassatt’s low grade freight line to funnel freight from the west to the eastern ports of New York, Philadelphia and Baltimore. Situated at the eastern end of the original mainline, Enola channeled traffic from all directions and at one time was the largest such facility in the Country. Constructed on the former Northern Central directly across from Harrisburg, the facility came on line in 1905 with construction continuing for several years. 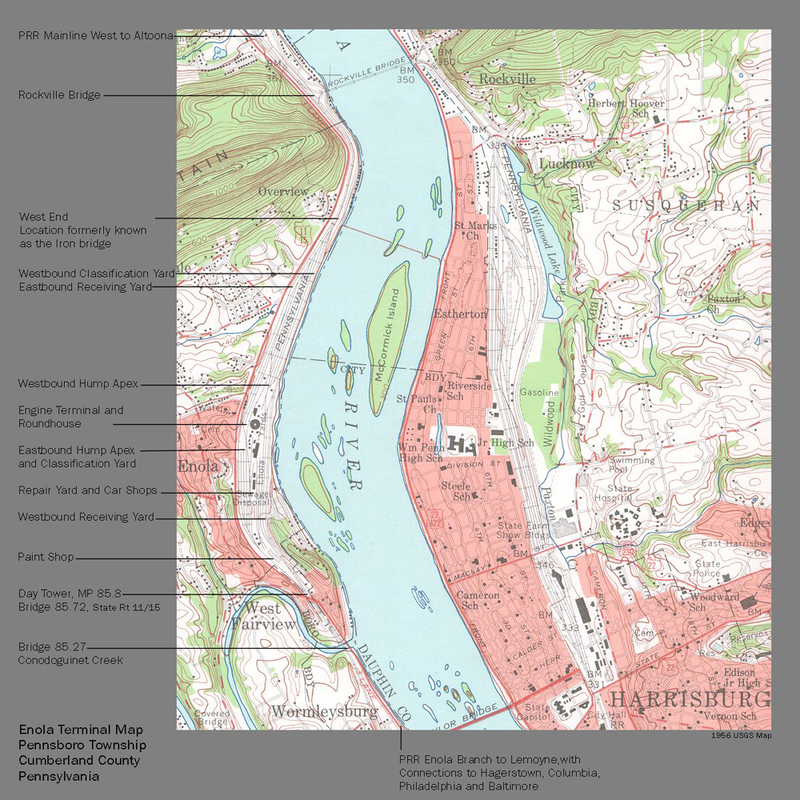 Oriented north-south on a large parcel of land along the west bank of the Susquehanna the facility stretches over 3 miles in length and once contained 145 miles of track and 476 switches. 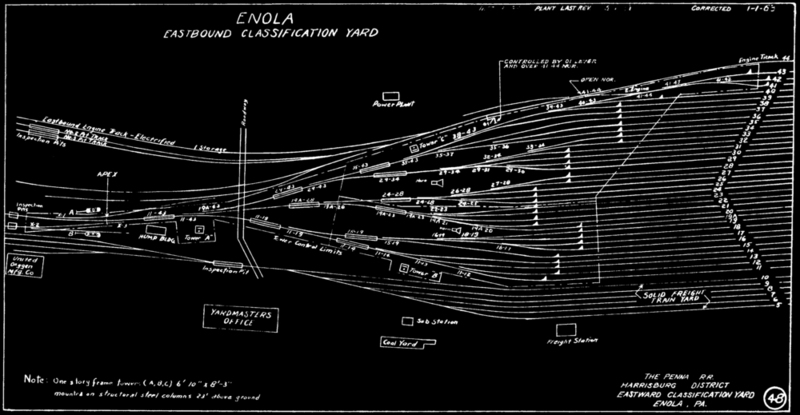 As typical freight sorting yards are designed, Enola was built with two receiving yards to handle arriving traffic from the east and west, two separate hump yards to sort traffic and construct outbound trains, and relay tracks for trains staying intact like coal or other mineral traffic that require staging or crew/ motive power changes. In the center of the complex were extensive engine facilities for both electric, steam and later diesels included a running repair shop, two turntables, and a 54 stall roundhouse. In addition the facility also had a full car repair and fabrication shop which prior to the 1956 opening of the Sam Rea Shops in Hollidaysburg was a major facility for constructing steel freight cars for the PRR. Later alterations included addition of a diesel shop in the late 1940’s and a container yard for containerized less than car-load service (LCL) service. As the western anchor of the Atglen and Susquehanna Low Grade, Columbia Branch and Columbia & Port Deposit, electric traction handled freight from the east upon completion of the landmark electrification project in 1938. The entire westbound receiving yard was under catenary allowing entire electric powered trains to arrive without assistance from yard crews. In contrast, the eastbound relay and hump tracks were only wired on the far-east end to facilitate departures utilizing electric locomotives. The facility was revised and expanded as traffic warranted with a World War II capacity of the east and west facilities each handling 5000 cars per day utilizing state of the art Union Switch and Signal car retarder systems helping to control and automate freight car sorting requiring less people while improving efficiency. Pre-War traffic averaged less than 10,000 freight cars a day, but at the peak of WWII traffic in 1942, Enola Terminal processed up to 20,661 cars in a 24 hour period! Westbound mixed freight departing Enola from one of five running tracks connecting to the Rockville interlocking complex just to the north. After the war, traffic levels decreased and the revision and expansion of the PRR facility in Conway just west of Pittsburgh was completed. Enola began to loose work in a system wide effort to reduce car handling and cut costs. Since then Enola has survived several service reductions and closures under PRR predecessors Conrail an Norfolk Southern. The facility was reborn in a smaller capacity in 2003 when Norfolk Southern began utilizing hump switching for mixed freight once again. Though not quite the facility it used to be, the engine terminal is still responsible for running repairs and inspections for the NS diesel fleet, being one of only three such locations in the Northeast region to carry out these tasks. Today Enola continues to provide many jobs to the local economy as both a crew change point for run through and originating traffic for five general road and yard crew pools. 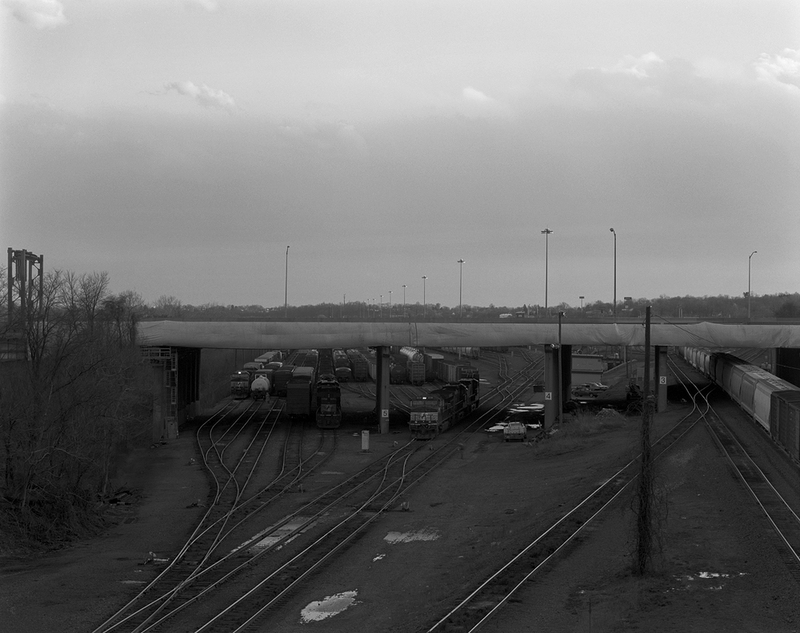 Current sorting operations focus around the former westbound classification yard (background) that Norfolk Southern rebuilt in 2003. Note the proximity of the facility to the beautiful Susquehanna River.